When the Pentagon liberalized their policy on gays in the military under ‘Don’t Tell, Don’t Ask’, President Clinton was excoriated by the right for homoficating the ranks, while sexual liberationists accused him of a sell-out. Two decades later President Obama favored scrapping his Democratic predecessor’s measure for a service-wide acceptance of gay military members. While I applaud the decision, I still hold onto my right to say ‘don’t ask, don’t tell’, for in the early 170s I hung out at the 1270 Club on Boston’s Boylston Street. I will admit that I danced with other men, but I never developed as lisp or funny walk and if it wasn’t for my queer friend Bruce I would have never attended the 2nd game of the 1975 World Series. Bruce exited from the disco at closing to discover young men thronging to the closed ticket booths of Fenway Park. He joined a queue and bought tickets. Bruce might have been as gay as a bouquet of daffodils, but he loved the Red Sox. Bernie Carbo was his favorite player. Mine was the right fielder Dwight Evans. He was a good friend and I think of him often, most recently when Bernie Carbo admitted to a newspaper reporter that he had been high of a wide assortment of drugs and drink for his famous at bat in the 2nd Greatest Baseball Game ever according to ESPN. 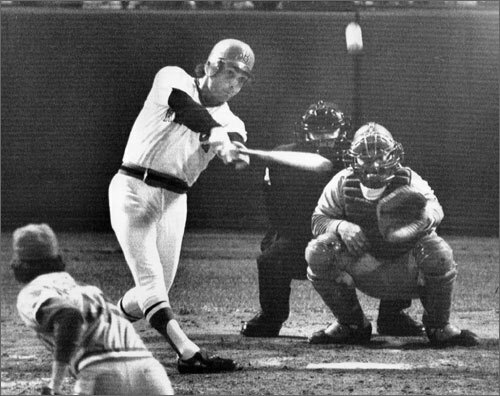 The 6th World Series game of 1975. His 8th inning at bat ranks up there with Mookie Wilson’s 1986 heroics against the Red Sox. Bernie Carbo pinch-hit for the pitcher with the score 6-3 in favor of the visitors. He looked horrible against the Reds’ finisher Rawley Eastwick. His miraculous foul on the 2-2 pitch has been described as having “all the athletic grace of a suburbanite raking leaves.” The next pitch he homered to center field. Two men on. 3 RBIs. Tie game. Johnny Bench said after the game it looked like a Little Leaguer learning how to hit. Pete Rose said it was the worst swing he ever saw. Don Zimmer said he thought it was over. Rico Petrocelli said it looked like a pitcher who hurt his arm, trying to make a comeback as a hitter. No one remembers his at-bat. 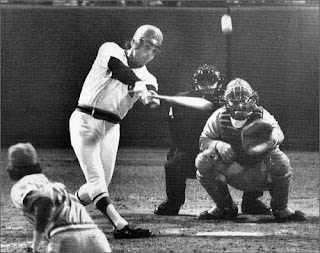 Carlton Fisk received all the glory, but I reveled in the memory of Carbo swatting down a killing pitch with a dead-down attack on the ball. A prescription for victory. Bruce and I were on something very similar for the 2nd game. No chewing tobacco or cigarettes. Speed and reefer and beer and ludes. Bernie Carbo is born-again and rues his behavior during his baseball career, but I love his description of playing high. This entry was written by Peter, posted on August 5, 2018 at 12:31 am, filed under boston, Drinking, Drugs, Sports and tagged 1975, bernie carbo, game 6, home run, lsd, marijuana, red sox, world series. Bookmark the permalink. Follow any comments here with the RSS feed for this post. Post a comment or leave a trackback: Trackback URL. Sorry to contact you here, but I wasn’t able to locate a contact page on your site. I am the owner of a few Thailand websites and would like to propose a link exchange between Mangozeen.com and two of my sites. This exchange will benefit both of us in terms of traffic and search engine visability. Please get back to me at your convenience to let me know if you’re interested in this link exchange.